Vanessa Herzog(AUT)started in the tenth pairing versus Brittany Bowe(USA)and before defending champion Kodaira, who skated in the twelfth and final pairing. The first 100 metres were crucial. Herzog said: “Brittany did a false start and I was really nervous. I like to stand a bit passive on the ice, so that I don’t do a false start. Eventually I got away well: 10.43 is my fastest ever opening. Olympic champion Kodaira opened in 10.37, a little faster than Herzog, but not fast enough to compensate for the slower full lap. She crossed the line in 37.20 and had to settle for silver, 0.40 ahead of compatriot Konami Soga(JPN), who took bronze. Kodaira said: “It’s a pity, but Vanessa skated very well and I respect her. My start was good, but after about 50m it was a little unstable. That was a bad moment. 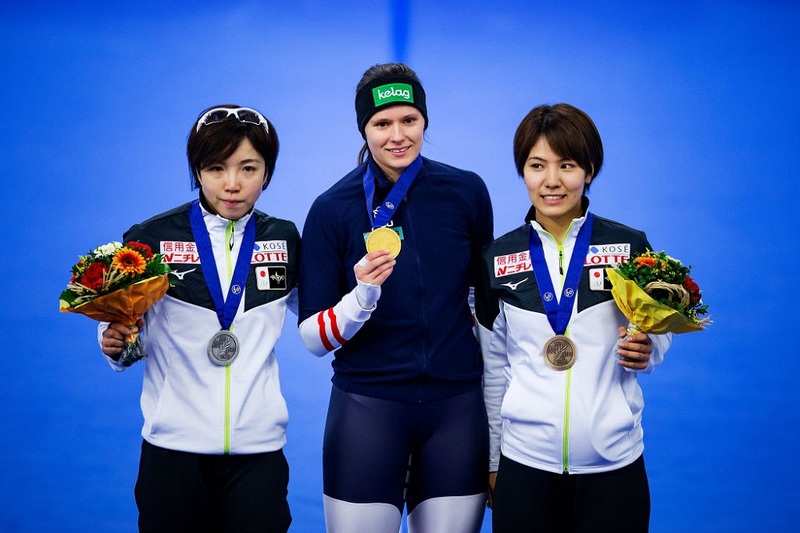 Sisters Mihoand Nana Takagiand Ayano Satomade amends for Kodaira’s loss, taking gold in the Team Pursuit. They set a track record time of 2:55.78 in the final pairing versus Russia’s Elizaveta Kazelina, Yevgenia Lalenkovaand Natalya Voronina, who collected bronze in 2:57.72. The Netherlands (Antoinette de Jong,Ireen Wüstand Joy Beune) took silver in 2:56.20, despite having trained in this particular line-up only for the first time on the morning of the race. Wüst said: “With this little preparation, finishing only four-tenths of a second behind Japan is very good. They skate together all season and that makes a world of difference." Despite having skated a lot together, the Japanese had trouble with their team work. Japan national coach Johan de Wit (NED) said: “The race was not so good actually. Miho had a good start, but our second skater (Ayano Sato) let the speed go down a little too much. The third skater (Nana) accelerated, she skated very well, but those changes (in speed) are not what we are used to. We normally skate a stable pace. Because of those fluctuations, the time went up a little too much towards the end and that’s a pity. The Men's 500m was very competitive, with the first 19 finishers all skating under 35 seconds. Olympic champion Håvard Lorentzen (NOR) skated in the third-last pairing and was impressed by the display of speed before him. “Ronald (Mulder, NED) skated 34.5 in the first pairing already and then Murashov did a 34.2 before me too. That’s superfast," he said. With 34.22, Murashov broke Kyou-hyuk Lee’s (KOR) 2011 track record by more than a tenth of a second. It inspired Lorentzen to do something special too. “I need the big scene to get the adrenaline running,” he said. Kulizhnikov, 24, skated in the final pairing but had a mis-stroke in the corner and clocked 34.53 to finish seventh and allow countryman Viktor Mushtakov to hang on to the bronze medal with a personal best of 34.43. After losing his 5000m world title on Thursday, Sven Kramer wasted no time getting back on top of the podium when he anchored the Netherlands to victory over Norway in the Team Pursuit. Norway had beaten Netherlands in the Olympic Winter Games semi-finals last year before going on to claim the gold medal. Kramer was joined by Douwe de Vries and Marcel Bosker. The Dutch men had never raced together before and held their first joint training on Friday morning. Despite the short preparation, they broke the 2011 USA track record by three seconds, clocking 3:38.43. Norway (Håvard Bøkko, Sverre Lunde Pedersen and Sindre Hendriksen) skated 3:40.80 to take silver and Russia’s Aleksandr Rumyantsev, Danila Semerikov and Sergey Trofimov clocked 3:41.31, clinching the bronze. Thursday's 5000m champion Pedersen was Norway’s locomotive again.